Sapphire 2019 is ready to light up the VFX scene! Get it? (Hint: Major changes to most photorealistic Lens Flare & Flare Designer available.) The 2019 version of the high-end visual effects suite delivers powerful new creative options & new workflows to seriously up your game. “The improvements to the Sapphire Flare Designer make modifying and customizing the new flare presets a breeze. The perfect lens flare can add so much value to a shot. I can’t wait to start using them!” - Alejandro Brubaker, Creative Director, sugarskullcreative.com. “I’m really excited about Sapphire 2019. The new WhipLash transition, a kind of suped-up swish pan effect is the next big, fun transition you’ll see all over TV!” - Ra-ey Saleh, Editor/Colorist. Compatibility: Adobe After Effects CC and Adobe Premiere Pro CC, Avid Media Composer, Autodesk Flame family, and OFX hosts The Foundry Nuke, Blackmagic Design DaVinci Resolve and Fusion, and Magix VEGAS Pro. 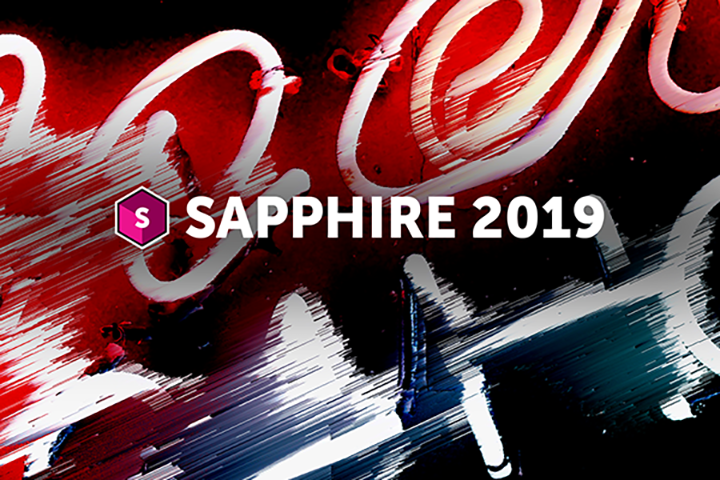 Sapphire 2019 is also available as eight individual effect category units: Adjust, Blur & Sharpen, Distort, Lights, Render, Stylize, Time, and Transitions.